Lack of access to modern energy amongst the poor inIndia is a major roadblock towards the achievement of Millennium Development Goals (MDGs) and a crucial development challenge facing the country. More than 400 million Indians lack adequate access to electricity/alternate energy, which inhibits education, income generation, and access to information. Traditional biomass (mainly fuel wood) remains the main energy source for cooking in rural areas, accounting for 75% of total rural energy demand. Fuel wood collection for biomass energy in rural India, remains a burden borne almost exclusively by women and girls. One third of households rely on kerosene for lighting, which provides poor quality light and poses health challenges. The World Health Organization (WHO) ranks indoor air pollution from biomass stoves as the third highest risk to health in India, after malnutrition and unsafe water, with women and children most affected. (DFID) Domestic waste generated in households is a biomass reserve that can be potentially harnessed for generating energy as well as for solving the problem of responsible waste disposal. Domestic waste disposal remains an imminent hygiene and sanitation issue in the Indian context as its irresponsible management leads not onlyto diseases andbad odor but also contributes significantly to global warming through methanereleased by decaying waste. Waste disposal is a rapidly growing problem in India across rural and urban households, communities and institutions like hostels, hospitals, convents, and old age-homes, et. al. Rising quantities and poor management of organic waste leads to environmental and health issues. The methods for treatment and disposal of wastes mainly used in India include land-filling, composting (aerobic and vermi-composting) and some waste-to-energy initiatives like incineration, RDF and bio-methanation (M. Sharholy K. , 2008). Conventional biogas plants have been a failure since these plants are difficult to install and maintain given their large underground tanks which rust, develop leakages or blockages. Most biogas programs in India in the past have been unsuccessful due to lack of regular maintenance and service centers. 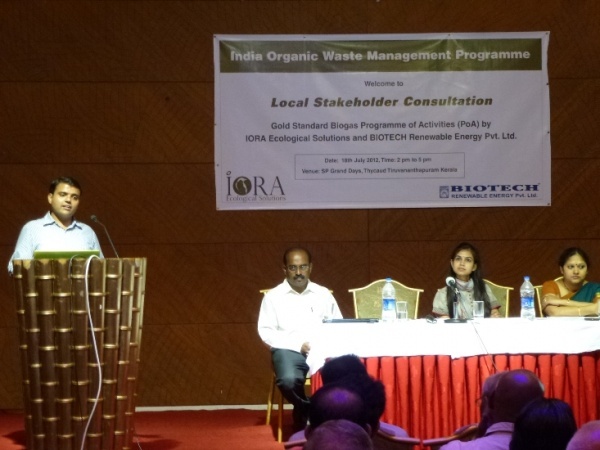 IORA Ecological Solutions (IORA) has developed a comprehensive solution to the waste problem through its innovative model, ‘India Organic Waste Management Programme’ (IOWMP), in partnership with award-winning technology partner BIOTECH Renewable Energy Pvt. Ltd. (BIOTECH). IOWMP aims to promote clean energy for rural and semi-urban household, community and institutional organic waste management through installation of innovative-patented biogas plants that eliminate all the problems associated with conventional biogas plants. The biogas units installed under this program enable energy generation through the combustion of gas and their installation can be financed through the generation of carbon credits against methane emission reductions achieved. 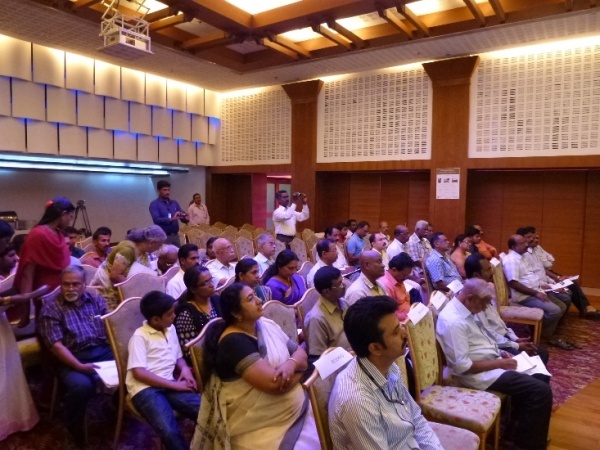 IORA and BIOTECH have rolled out more than 18,000 biogas plants at domestic, community and institutional levels across the state of Kerala in India under the IOWMP model. 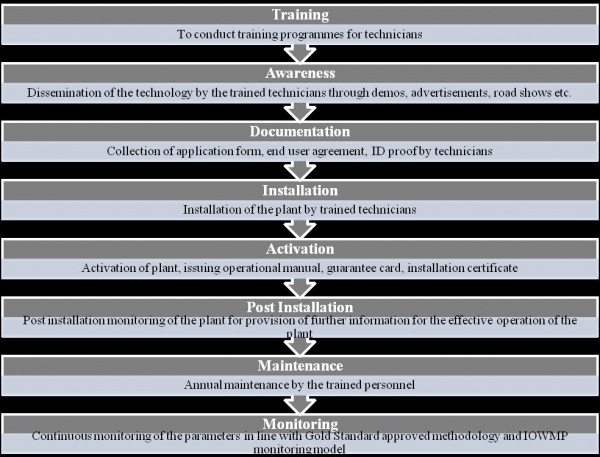 Because of the innovative technology, customer training, monitoring and after sale service of IOWMP, the success rate of these plants is at an astounding 99%. IOWMP utilizes a patented Portable Domestic Bio Waste Treatment Biogas Technology, which enables the biogas unit to work without the regular need for cow dung unlike the conventional biogas plants. The modular structure of the design ensures robust performance of the biogas plants while also rendering their operation very simple for thermal and electrical applications. The mission of the IOWMP programme is to harness and manage organic waste management in India through the dissemination of innovative biogas plants at domestic, community and institutional levels. The biogas thus recovered is utilized for the provision of thermal energy and electricity, thereby replacing the use of fossil fuels and non-renewable biomass for cooking and heating purposes, and electricity sourced through combustion of fossil fuels. Prior to the implementation of the IOWMP programme at the project sites, the energy requirements for cooking and heating were being met by fossil fuel or firewood and electricity was being generated by combustion of fossil fuels or sourced from the grid. The installation of the biogas plants displaced these fuels with biogas generated from bio-digesters utilizing wastes that include, but are not limited to, cooked food wastes, vegetable peels, fruit wastes, fish & meat wastes, organic waste water such as rice boiled water, fish &meat cleaning water, dish wash water, etc., market and slaughter house waste, human excreta, poultry droppings, cow dung, etc. 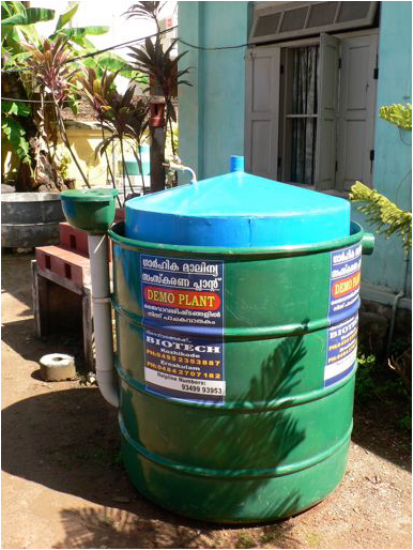 Thus, implementation of the programme led to avoidance of carbon dioxide emissions from combustion of fossil fuels and other non-renewable biomass and avoidance of methane emissions into the atmosphere from decay of dumped wastes.The installed biogas units improved the lives of thousands people in Kerala and saved several thousand tonnes per year of carbon dioxide (CO2) simply by getting rid of organic wastes. By addressing both methane and carbon dioxide emissions, the IOWMP program successfully avoids potent greenhouse gases from being released into the atmosphere. The community and institutional units implemented under this programme can be designed to be portable or fixed depending on the specific user requirements. The waste raw material fed into the units is harnessed from village-panchayats, hotels, hostels, and schools, among others. The smaller units are used for generating energy and larger capacity plants can also be used for production of electricity that can meet in-house requirements or community requirements like street lighting. TheIOWMP is also developed as a carbon Programme of Activities (PoA) under the Gold Standard (GS), which is a premium carbon standard assuring Green House Gas (GHG) emission reduction and high sustainability benefits. The PoA, arguably India’s largest waste-to-energy GS PoA, is categorized as a ‘Renewable energy supply’ activity as it involves generation and delivery of energy services of heat and electricity from biogas, and ‘Waste handling and disposal’ activity as it recovers methane from waste. All forthcoming installations that will form apart of Voluntary Project Activities (VPAs) will be added to the IOWMP. In lieu of this, the end users will benefit from an upfront discount on the plant and free lifetime maintenance service or carbon revenue sharing or a combination of these in the future. 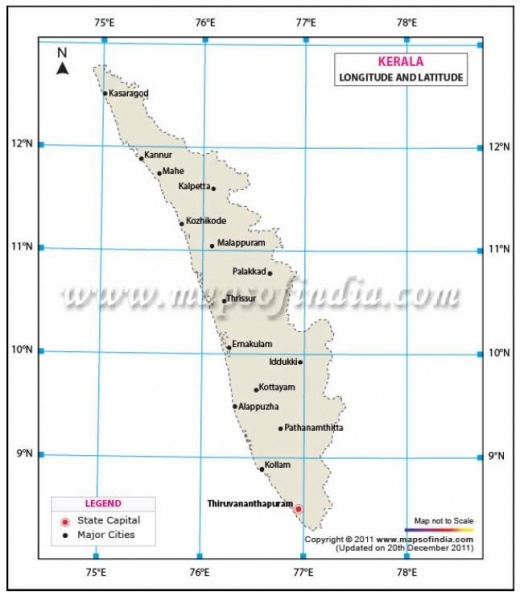 SMSS Hindu Mahila Mandiram is one of the oldest non-profit social organizations in Kerala. Their aim is to work for the betterment of women. It runs a shelter for poor women and orphan girls irrespective of their religion and caste. The organization is concerned with care, education, empowerment and rehabilitation of needy girl children’s and women. IOWMP programme installed a mid size 15cubic meter waste treatment plant at their institution. The installed plant is capable of treating 100kg of solid waste and 100 liter of organic wastewater discharged from the institution per day. The biogas generated is utilized for cooking purposes whereas the slurry is used as a fertilizer for cultivation of vegetables at the project area. The plant is very useful for the easy disposal of the waste generated in the institution. The biogas thus generated provides 50% of all cooking fuel requirement of the institution. This has ensured reduction in cost and self-reliance in energy and also a steady supply of organically grown vegetables from the project area. 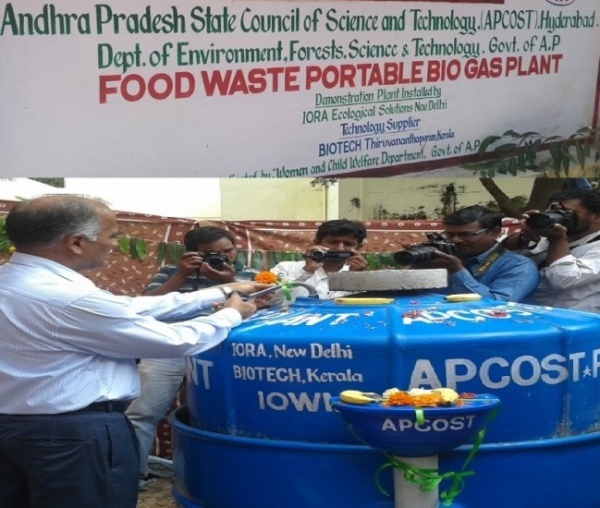 Another pilot version of 1 cubic meter capacity of Demo Food Waste Portable Biogas Plant has been installed in collaboration with Andhra Pradesh State Council of Science and Technology (APCOST) at the Old Age Home, Women Development & Child Welfare Department, Yosufguda, Hyderabad, India. This plant is using kitchen waste mixed with wastewater from the old age home kitchen to convert biodegradable materials into cooking gas. The plant can treat 2-3 kgs/day organic waste and support single burner stove for 2-3 hours /day with the gas produced. It also avoids 2-3 tons of CO2e emissions perannum. The innovative biogas plant consists of a ‘digester’, which is the lower portion with feed and discharge facility for the degradable bio-waste material. The gas collector, which is at the top portion, has a flow control device for regulating the flow of gas to be collected in the gas holder housed within it. The gas holder being provided with gas flow control means to regulate the supply of gas flow for consumption or other utility purposes. The digester is provided with feed and discharge facility, wherein an inlet pipe is present for feeding the waste matter into the digester and an outlet pipe at the top of the digester for the digested slurry to come out. 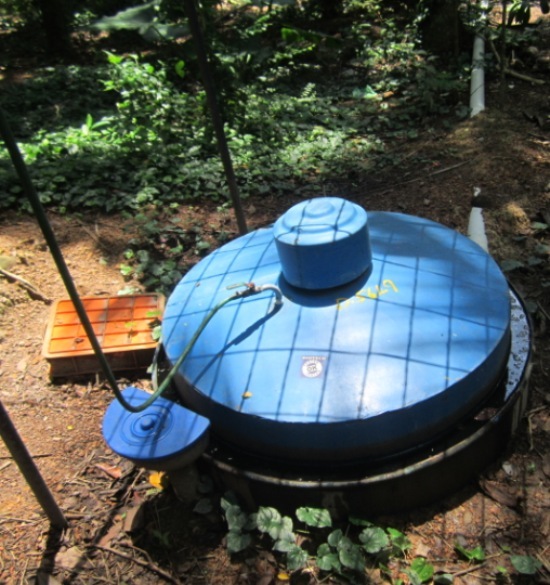 This biogas generated has multiple thermal applications. 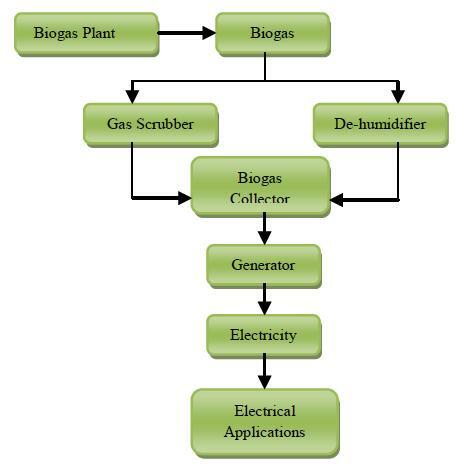 The biogas generated is used in an engine to generate electricity for electrical applications. 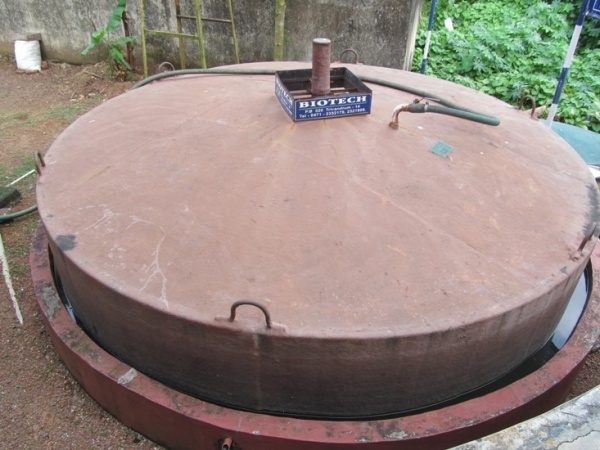 The main substrate of biogas digesters are cooked food wastes, vegetable peels, fruit wastes, fish and meat wastes, but cow dung needs to be used initially to provide a culture of suitable bacteria to get the digestion process started. Promoted the use of bio-fertilizer, which is a by-product from the bio-digester and displaced harmful chemical fertilizers. Air Quality – Biogas units used in the IOWMP programme are based onclean technology as they generate energy derived from wastes and in doing so, avoid emissions of CO, NOx, soot or smoke, hydrocarbons, etc., caused by combustion of firewood and fossil fuel that were being used prior to implementation of the programme. Water quality and quantity– The Programme reduced use of fuel wood thereby potentially reducing deforestation and resultantly soil erosion. Also the programme leads to use of slurry from biogas units as organic manure, which contributed significantly towards maintaining the quality of soil and even improved it. Employment opportunity – As the people related to the IOWMP programme have been trained by knowledgeable personnel in order to qualitatively potent to execute their assigned roles and responsibilities for successful operation on each stage of the programme. Hence, the programmeprovidedsignificant quantity with quality employment opportunities. Livelihood of the poor – The biogas digester units under IOWMP programme, installed at household/institution/community level which has improved the livelihood of the project site through reducing user energy costs in the long term and free-time for other income generating activities.The programmeprovided employment opportunities (related to installation, maintenance, servicing, etc) to the local people,which resulted in income generation for the rural households and hence helped towards gradual positive changes in living standards, thus contributing towards the livelihood of the poor. The programme has built a comprehensive rollout and monitoring plan to ensure accountability, traceability and successful implementation. The IOWMP team has monitored all constraints that were faced in installing the plant and documented key learning, which have been helped in further installation of the plants. The performance data have maintained in a web based ERP system to track each plant from cradle to grave. Whatever applications have received, fed into the online system which tracks the progress of the installation of biogas plant with respect to each user and has given a 10-day turn around on any technicalcompliant for the 10 years period. Waste from households, communities and institutions can be treated, reduced, reused and recycledforhuman and environmental benefits. The plants can not only help save the dependent communitiesfrom pollution, but also improve people’s health especially the women’s, since they are exposed to high level of indoor smoke and also can avoid the drudgery of collecting fuel wood. Engaging stakeholders and their support is essential to assess the actual local conditions & needs and the required facilities & security that need to be designed into future plants so thatnew initiatives can be introduced in different communities. Providing required training programme and periodically introducing follow-up training in order to make the local/ dependent communities stay connected with programme goals. Project developer/ facilitators should be made to understand thatongoing monitoring, and surveillance of activities is crucial for complete buy-in from stakeholder and for wider acceptance and success of the programme. Well-documented activities during the learning and training process will help create a checks and balances system for supporting ongoing monitoring and evaluation. The innovative portable IOWMP bio-waste treatment biogas plantsensure suitable hygienic disposal and treatment of any type of easily degradable organic waste & waste water while harnessing the waste for producing cooking gas using the plants’ anaerobic or bio methanisation technology, thereby reducing consumption of fuelwood and petroleum gas. This responsible disposal of waste using IOWMP’seco-friendly technology address one of the major environmental issues in India: waste management. The biogas plant developed can be installed in every household leading to a silent green revolution. Since every household has a real source of waste and wastewater, feed material is available in abundance for the biogas plant. The installation of such a plant would fundamentally change people’s attitudes towards hygienic waste disposal while helping them tap the energy of biogas from it. Another advantage of this plant is that it helps treat the liquid organic waste from the kitchen immediately. 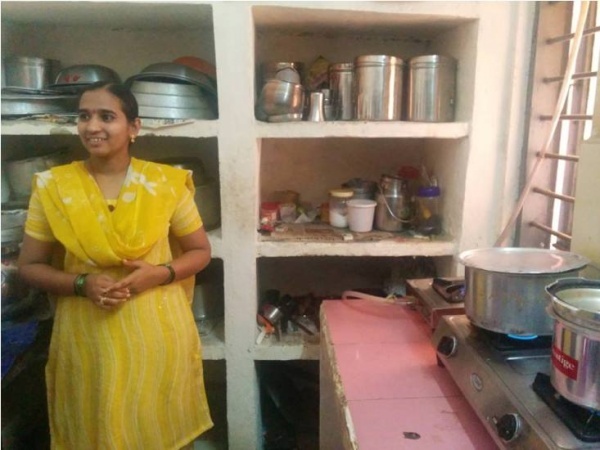 IOWMP’s hope is that in thefuture, every home could become a small powerhouse through the production of energy or biogas for cooking purposes from their own house waste. DFID. (n.d.). Retrieved 05 12, 2014, from http://iati.dfid.gov.uk: http://iati.dfid.gov.uk/iati_documents/3733528.docx. M. Sharholy, K. A. ((2008). 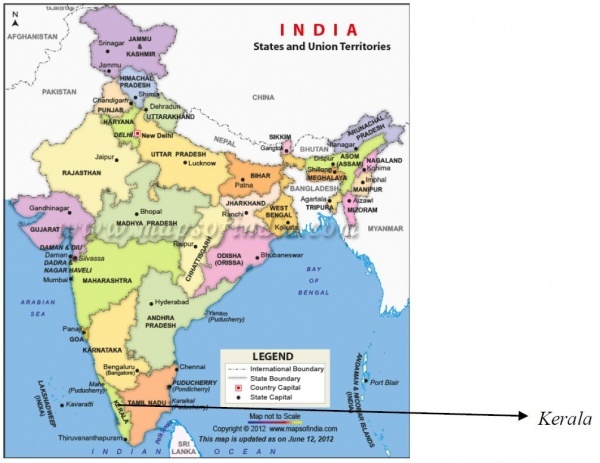 “Municipal Solid waste management in Indian cities–A review”. Journal of Waste Management, 459–467.